During his first State of the State speech earlier this week, New Jersey Gov. Phil Murphy highlighted his administration’s recent audit of the state’s tax break program. He criticized lax oversight at the Economic Development Authority and said the money could have been better spent elsewhere. More than just bashing enforcement of the incentives, Murphy criticized the law itself. “The audit revealed bad policy, badly run, a program more likely to have been drawn-up in a smoke-filled back room than created for New Jersey’s future,” he said Tuesday. Yet in Camden, perhaps the largest beneficiary of these tax breaks, officials saw a different picture. “The Economic Opportunity Act created opportunities for investment at a level that was appropriate for Camden City,” said Camden County Freeholder Director Lou Cappelli. “Thousands of jobs have been or will be created.” Cappelli was referring to the Economic Opportunity Act of 2016, which opened up the tax break program and, according to Cappelli, paved the way for $2.5 billion in investment in Camden in the last five years. “Prior to this program, Camden City had the highest crime rate, the highest dropout rate in high school, the highest unemployment rate in the nation. That has all been reversed,” he said. Cappelli agreed that businesses that break the rules should face consequences, but he said the program itself has spurred historic levels of investment in the city. Camden Yards Steel moved to the city’s port in 2000, well before the expansion of the state’s tax incentive program. Then, a few years ago, tax breaks started going out. Camden Yards Steel received one to remain in the city. Other companies like Holtec International, Subaru, the Philadelphia 76ers and American Water set up shop there — though some drew criticism since they only relocated from elsewhere in New Jersey. Murphy later clarified that he was not specifically referring to Camden when he criticized the state’s tax break program. Murphy has turned his criticisms of the current tax break programs, which expire over the summer, into suggestions for a new incentive program that would cap awards and toughen reporting requirements. Still, some critics within Camden believe Murphy’s critiques are spot on. “From the very beginning, I saw it as a corporate welfare scheme,” said Kelly Francis, a past president of the Camden NAACP. Francis said the state doled out tax breaks to then Gov. Chris Christie’s friends and political allies, like South Jersey power broker George Norcross. Conner Strong & Buckelew, the company Norcross runs, received a state tax break in 2017 to move its headquarters to Camden. Norcross sits on the boards of Holtec and Cooper Hospital, which also received incentives. Francis’ concerns went beyond cronyism though. He said the companies moving into Camden are simply relocating from elsewhere in the state and are not offering jobs that residents are trained for. 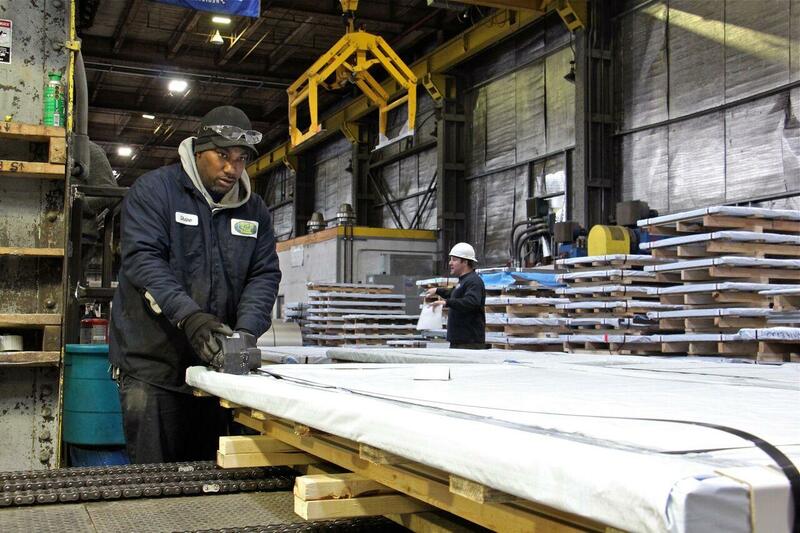 About one third of the workforce of Camden Yards Steel lives in Camden. But the state’s tax incentives do not mandate that companies hire from within the city.